Line a baking dish (approx 10inch x 10 inch) with parchment paper and pour in the yogurt. Smooth down evenly with a spoon. Melt the peanut butter in a bowl or mug in the microwave for approx 15 seconds. Pour or spoon it onto the yogurt and use a knife to swirl it through. Next melt the jelly/jam in the microwave for approx 8 seconds. Spoon that onto the yogurt and peanut butter and use a skewer to swirl it around. Place the dish in the freezer for at least 4 hours or until frozen solid. Remove and cut into 12 pieces. 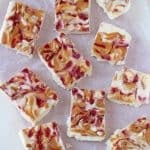 The Frozen Yogurt Bark will keep in a freezer bag or container for up to 8 weeks. This snack can be made dairy free by using a non-dairy yogurt and nut free by using sunflower butter.